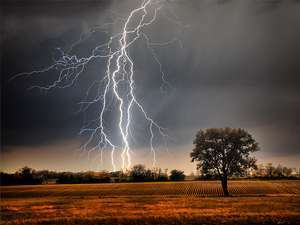 Serious panic has reportedly gripped the residents of Kuniyi community in Shagamu Local Government Area of Ogun State, as lightning struck 11 people, killing two teenagers on Sunday. According to Daily Trust, the victims, a boy and girl, were said to have been struck dead while playing football. The deceased are identified as Emmanuel (male) and Ogechi (female). Bodies of the victims were not removed until yesterday morning. An early morning rain was said to have fallen on the bodies. According to witnesses, the incident occurred about 2p.m. on Sunday at Kuniyi Primary School Football Pitch. It was learnt that immediately the lightning struck, it bolts got 11 people, but nine were later revived by residents, while the two teenagers died. A resident of the community, Pastor Idowu Johnson, described the incident as unfortunate. A man, who identified himself only as pastor, told our correspondent that the incident occurred where people were watching a football match. He said: “The two teenagers were struck by lightning when it was raining. There was a lightning, followed by a thunder clap. Later, I heard some people shouting. I went there to see what happened, and I saw the two people on the ground. They were lying there; there were about other nine wounded people, who were rushed to the hospital. The traditionalists that came around confirmed the two dead. “The traditionalists, I learnt, came from Sagumu area of the state and promised to return on Monday (yesterday) for some rituals. They warned family members of the dead people not to move the bodies until proper cleansing. They said it was an abomination in the land for lightening to strike someone to death. Another resident, Mr. Ebenezer Soneye, said that the 11 teenagers came from Ewu Lisa community to play football at Kuniyi. He said: “We tried to persuade the Baale of the community to allow the parents of the victims to go with their remains, but they refused. They insisted they must follow traditions. But what we are afraid of is epidemic. Soneye added that since the incident, people had been trooping to Kuniyi community to get the fact of the incident and see the victims. Kuniyi residents said the incident was strange, because they had never witnessed such before. A woman, who did not want her name in print, said people returning from church rushed to the scene and started praying for the victims.